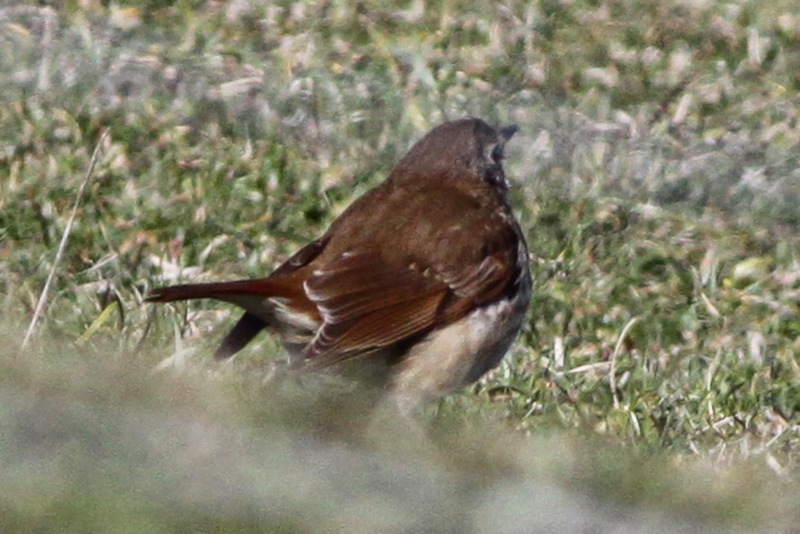 Fair Isle Bird Observatory: the Warden's diary: Hermit Fab! Today's star. Hermit Thrush in Hesti Geo. We weren’t complaining after the spring we had enjoyed so far and good birds were still arriving, but it had to be said that the birding had slowed down a little compared to the frenetic spell at the end of April. Amongst the lingerers there was the seemingly ever present Caspian Stonechat (is it going to attempt to summer on the island? ), Subalpine Warbler at Burkle, Grey-headed and up to 2 Blue-headed Wagtails and Goosander, whilst the Short-toed Lark and Kumlien’s Gull were both seen on 11th. The NNE winds on the 11th also delivered a Dotterel to the top of Ward Hill and a Hawfinch to Quoy and then Haa, although there was a general pattern of declining migrant numbers. 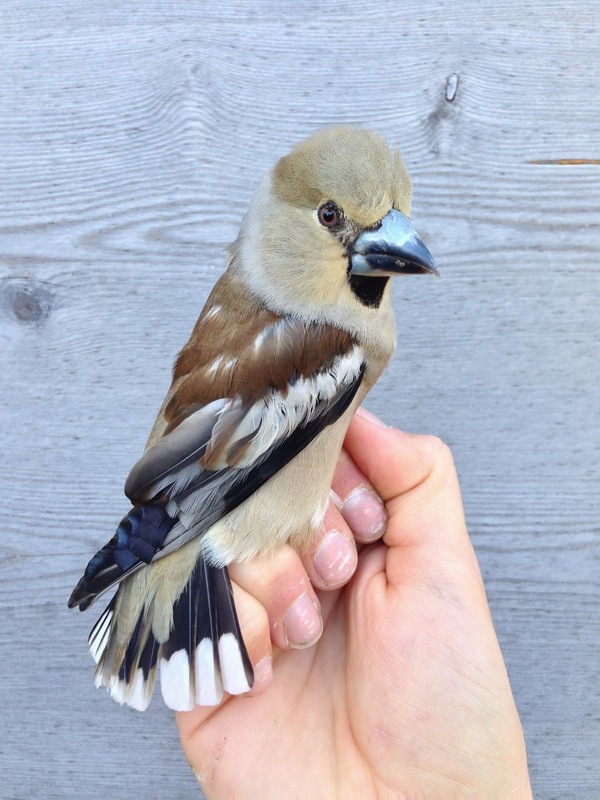 After being found in the south of the island, this female Hawfinch moved to the Obs where it was caught and ringed on 12th (it was also seen in the Gully on 13th). Photo: Ciaran Hatsell. The most notable arrivals of the 12th were Susannah, Grace and Freyja returning from Lerwick (along with so much shopping that most of it is having to come back on the ferry on Thursday), although the first Common Tern of the year accompanied a small influx of Arctics and a Wryneck at Field was probably a new bird. The 13th was following in a similar vein, with a breezy NW wind, but pleasant sunshine, making for a nice enough day to do census but not much in the way of new arrivals. Ciaran discovered a Bluethroat in the Walli Burn (it first drew attention to itself by having a fight with a Sedge Warbler! ), which gave a little bit of hope and a Grey Wagtail in the Vaadal was the first to be ringed this year, but the afternoon seemed like a good time to catch up on some other jobs. The Hermit Thrush appeared to have a damaged left eye. Curiously, a spring record of Yellow-headed Blackbird on Fair Isle (26th April 1990) was thought probably to have been an escape - with a damaged eye one of the main reasons for its failure to make the British list. That was until Judd Hunt (a visiting tour group leader) found a HERMIT THRUSH at the base of Malcolm’s Head. The usual ‘controlled panic’ ensued and all guests and staff were soon on the scene and enjoying this amazing American vagrant. It was hardly the sort of bird that was on anyone’s mind as a potential find for the day (although we had been talking about the possibility of an American sparrow later in the week given the forecast), but that’s the beauty of birding I suppose and especially birding on Fair Isle. The pale thorns on at least some of the Greater Coverts seem to indicate that this is a first-summer bird. Whether it was an autumn vagrant to Europe in 2013 that is heading North (slight evidence in favour of that suggestion was the presence of 2 Song Thrush on the island today, both newly arrived migrants, with one of them even feeding alongside the Hermit for a while), or an overshooting bird that missed the east coast of America and just kept going, isn't clear. The distinctive underwing pattern was difficult to see in the field, although it is captured in this photograph by Deryk Shaw. 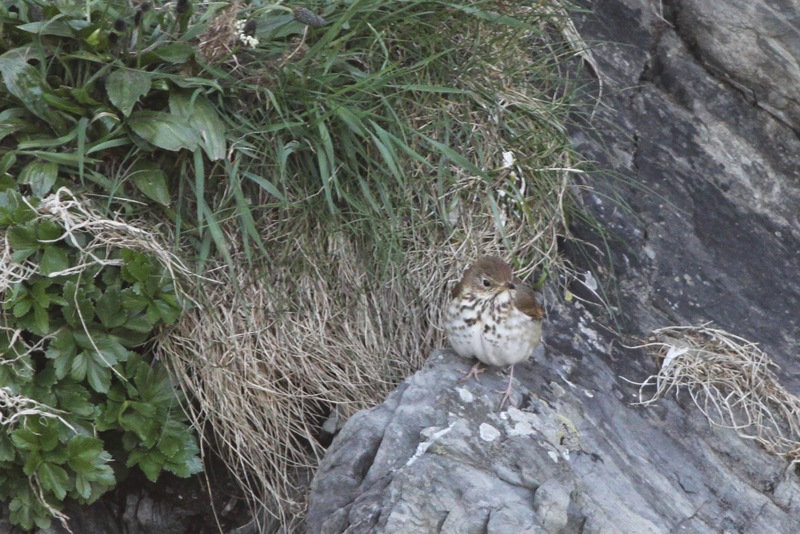 This was the 10th Hermit Thrush for the UK and the third for Fair Isle. 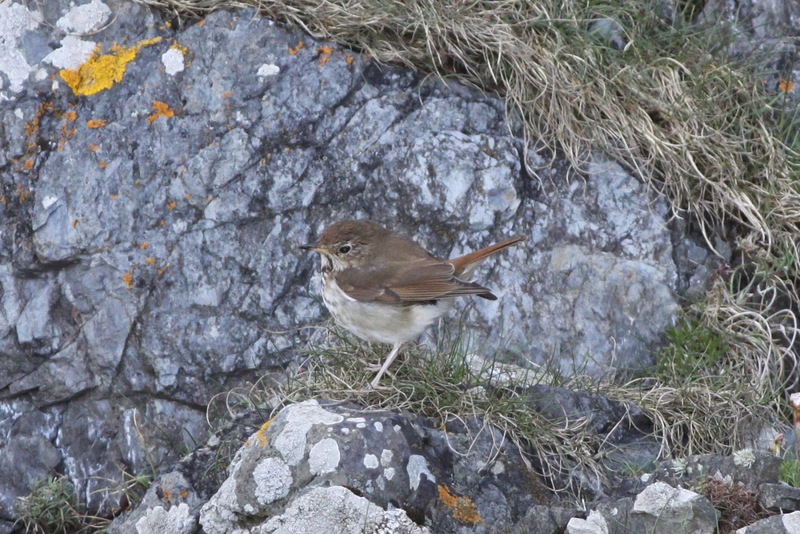 It's the second spring record for the island (the only other spring UK record is from Fetlar on 30th April 1998) and, following birds on Fair Isle in June 1975 and October 1995, it has appeared slightly ahead of the pattern of one every 20 years! 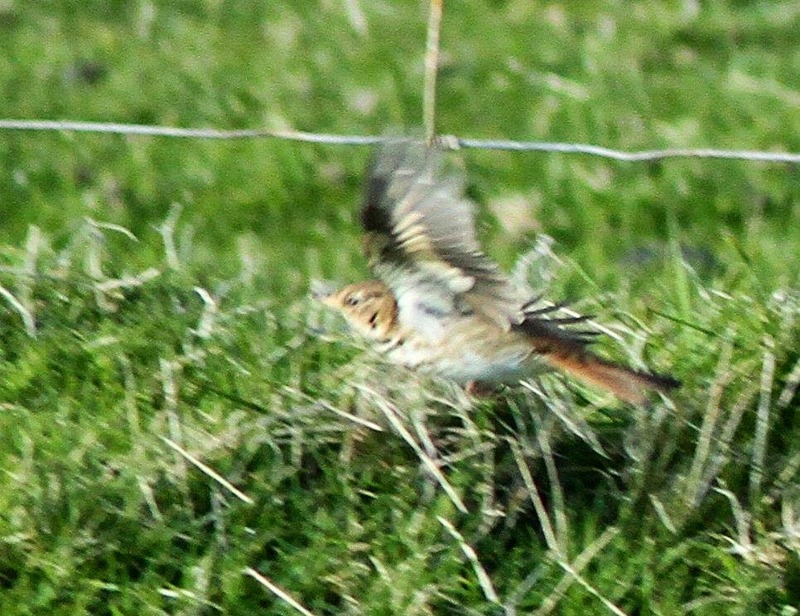 The marginally commoner (in the UK) Veery has yet to make it to Fair Isle, despite several other records from the Northern Isles.